We have a herd of athletes in our house and there are three things we run out of on a regular basis — food (teenagers eat…a LOT), Deep Blue rub, and ice packs. Throw in a mom with a bum back, a kiddo with some muscle issues, and a very active herd of little kids that seem to bump heads and you need a lot of ice packs. So, I created my own. We’ve been using them for a while now and love them. And even better, they were ridiculously easy to make and cheap. All you need is zippered food storage freezer bags, water, and rubbing alcohol. Combine water and rubbing alcohol in the zipper bag and close. Then place inside the second bag and seal. Place in freezer until use. 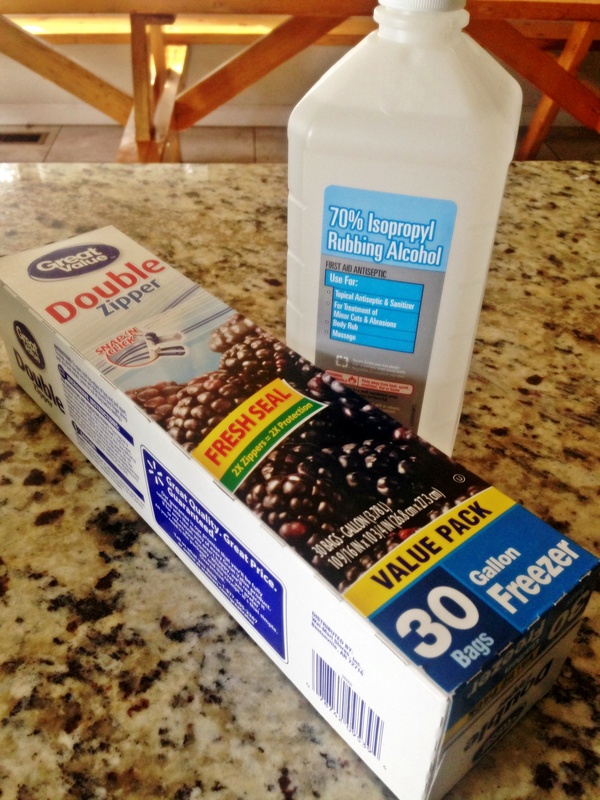 The rubbing alcohol prevents freezing and creates a gel-like consistency that easily molds to whatever injured body part you might need to ice. Finger caught in a door? No problem. You bonked heads with your brother on the trampoline? No worries. You got tackled at football practice? We’ve got that covered. And, you stood up too fast switching laundry to the dryer and threw out your back? Here you go. Just divide the ingredients in half to make quart sized bags for little people.